Hotel Euro Quiris i Rom, Italien: Reservér nu! Cancellation pilicy 15 days.Penality for no show or cancellation : 3 nights. Its location is ideal for tourists who want to spend a few days in the most famous historical-cultural city of the world, or for people who's just passing through. It's possible to reach, just by walking, some of the best sites of the city, such as the S. Maria Maggiore Church, the Colosseum, the Terme di Diocleziano, the Porta Pia Museum, and the wonderful Villa Borghese. The proximity to the railway station and to the underground main station allow the visitors to reach easily the City Centre, the Fiumicino Airport (FCO), the Ciampino Airport (CIA) and every else site of Rome. 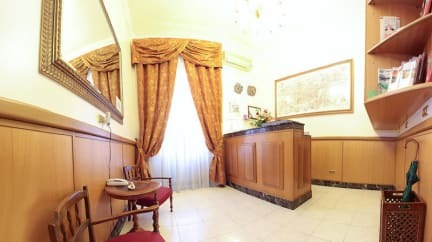 The hotel conducted with traditional familiar formula and with warm hospitality offers rooms provided with Private Bathroom,hairdryer,safe,TV lcd,wifi,telephone,air conditioning. -The payment will be in cash. -There is a cancellation policy of 72 hours.(12:00pm. local time)Penalty for cancellation after that date or no-show: two nights. On 28 July 2010, the City Council of Rome has approved, subject to the provisions of art. 14, paragraph 16, read. e) of Decree Law No 78, 2010, as ratified by Law No 122, 2010, the introduction of a grant of stay on tourist services City Council Resolution No. 67, 28/29 July 2010).On 28 December 2010, the Roman authorities confirmed that the Contributo di Soggiorno levy will go ahead on January 1, 2011. This will apply at a rate of 3,00 € per night per person. The levy will be paid on the spot before check-out by the person staying at the hotel. 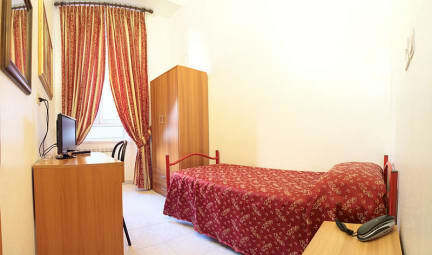 The maximum number of nights taxable per stay is ten.